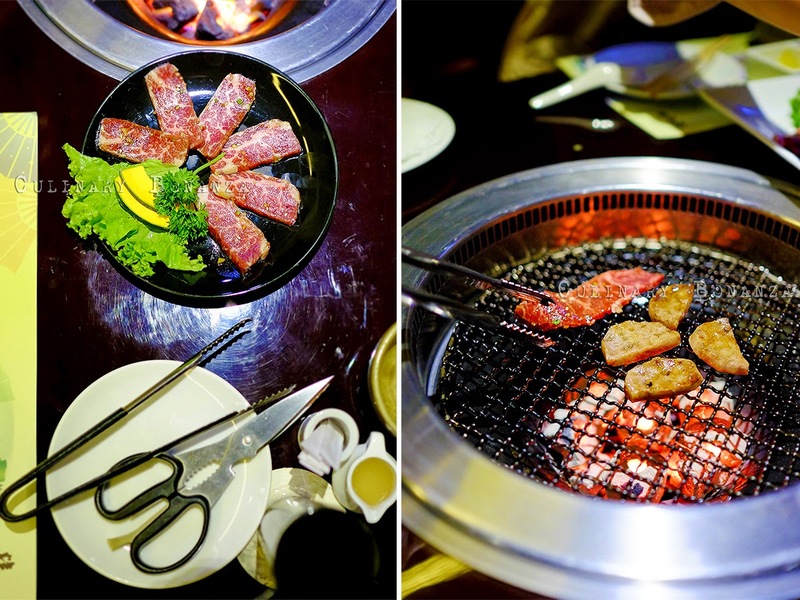 Hidden in the basement floor of a niche shopping square in South Jakarta, this hole-in-the-wall Japanese-Korean BBQ dining recreates the feel of a true yakiniku/izakaya place, just like in Tokyo's Ginza. Literally, Yakinikuya means a place that sells grilled meat, and The Yakinikuya in Jakarta is the sister of Takemori Japanese Dining of ELI Corporation. Despite having been around for a year, surprisingly, it has gone under the radar of foodies in Jakarta. Well, I guess the Japanese and the expats who frequented Yakinikuya have not been so generous in sharing about their little well-kept secret! To reach Yakinikuya, you will have to go to the basement of Darmawangsa Square, a niche shopping arcade in Darmawangsa, which is a residential area of the affluent and expats (or both) in South Jakarta. Once you exit the lift, you will find it to your right. Not much of a grand entrance, but I imagine this is what it must be like with izakayas in Ginza. Once inside, one quick look from left to right would already show you the entire interior of Yakinikuya. A narrow aisle splitting the restaurant into left and right lead straight to the kitchen. No overhead fume hoods in sight! Yakinikuya serves assorted BBQ, all-time favourite single cut BBQ and premium BBQ, Appetizers, Snack, Soup, Bibimba, Dessert and Drinks. For the type of quality meat served here, the prices are absolutely reasonable, compared to its competitors. Gyu Tan Salad (photo below) - fresh chopped lettuce salad with spicy beef tongue drizzled lightly with its secret dressing. Ishiyaki Bibimba (photo below) - Hot stone rice with minced beef, vegetables and egg. 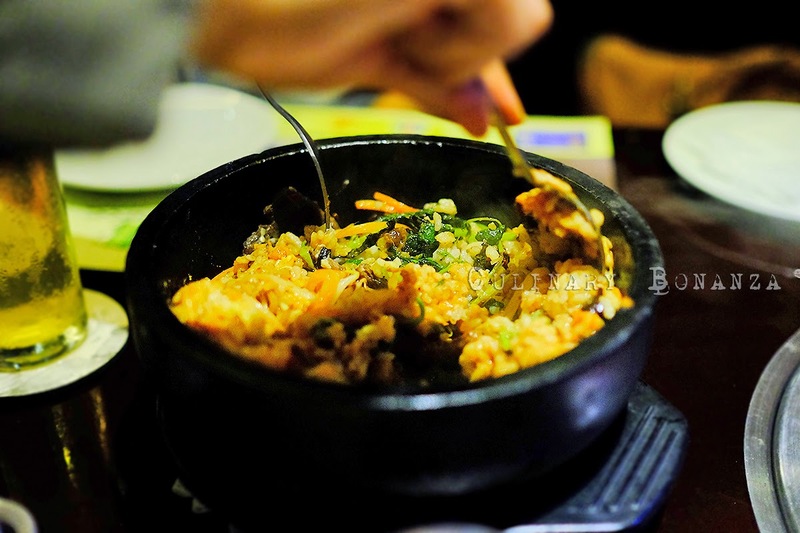 You know what the Japanese and Koreans would do when eating bibimbap, they don't immediately mix the rice. Instead, they'll let the bowl to sit for a while and let the rice form a dry and crispy outer crust. One of the better bibimba I've ever had. 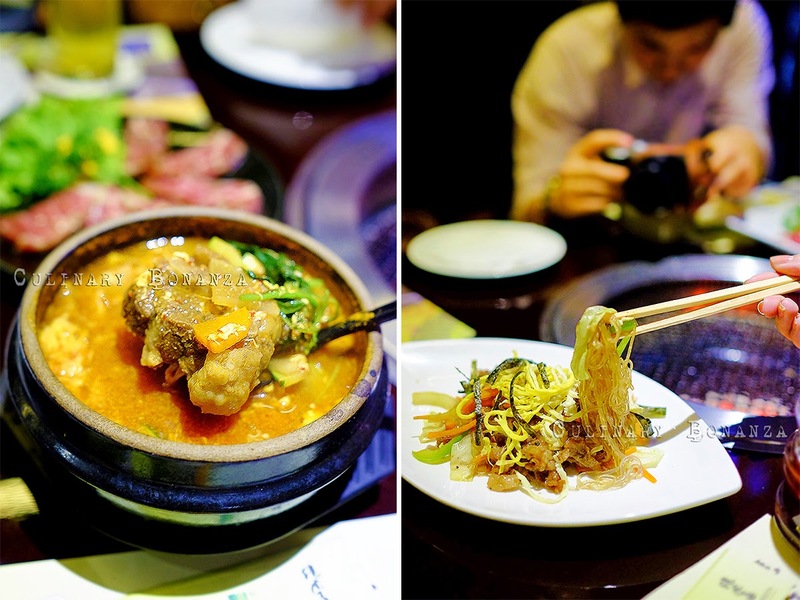 Komutan Soup (photo below)- clear oxtail soup with glass noodle. Chapuche (photo below) also known as Japchae, and it is seriously one of my favourite japchae ever. Silky and well seasoned cold glass noodles, with generous beef and vegetables. So, after teasing our tummies with the yummy appetizers, it was time to get the grill sizzling! All the meat comes served with spicy miso and shoyu tare sauce. Optional, you can order its Sanchu or assorted vegetables to wrap the meat. I personally like to eat the meat without the sauce to taste its real flavour and juiciness. Jou Karubi (photo above) is the best cut of US premium short rib, supposedly one of favourite of the guests here. Ginza Assorted BBQ Set, a set dish comprising Wagyu Karubi, Honetsuki Karubi, Toro Tan Shio and Ebi Shioyaki, totalling 300gr. This is good to share among 2-3 people, gives you good variety in good quantity and definitely good price. Wagyu Karubi (photo below) - look at the marbling of this Australian Wagyu short rib! This is my favourite cut of all, so juicy and tender! And for dessert, we had the BBQ Marshmallow Sandwich, which is basically smores, but most of the Japanese guests have no idea what it is, so the owner decided to name it literally. This is a fun dessert to have with the kids and the taste? So addictive! Value Lunch Set is available on Weekdays from 11 AM - 2.30 PM, you can choose the Value Lunch Set priced between IDR 68,000 - 98,000, which will get you one choice of meat (from the available selection), Sanchu, Soup, Kimchi & rice. Such an affordable luxury for quickie lunch right?